EBC*L Arab World differentiates its partners, categorizing them into strategic partners, accredited training centers and examination centers. Our strategic partners collaborate and support our operation thus delivering high level services on an international level. 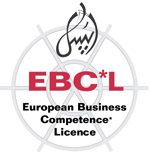 With regard to accredited training centers, EBC*L Arab World has to follow the international standards determined by EBC*L International, thereby it only approves training centers who are able to fulfill those criteria. Our accredited centers have to renew their accreditations every two years in order to deliver the EBC*L training to their candidates. Finally, EBC*L Arab World also builds a special relationship with examination centers thus maintaining the independence of the EBC*L examination and its standard.